Valence House is the only surviving manor house in Dagenham. It dates back to medieval times and is partially surrounded by a moat. 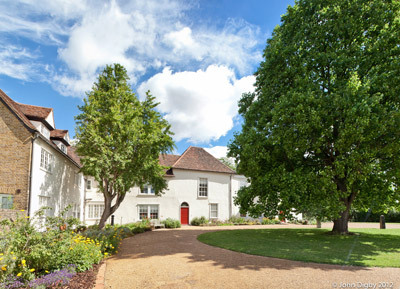 Valence House was voted by the Guardian as one of the 50 best free things to do in London. Admission is free. Exciting galleries tell the story of Barking and Dagenham and its people throughout the ages. Discover the tranquil herb garden and Dig for Victory plot. You can also research local and family history in our Archives and Local Studies Centre. Round off your visit by enjoying light refreshments in the Oasis tearoom and browsing the gift shop. We're proud of our tearoom, and we know it’s an important part of your visit. Pop in for a quick cuppa, spend some time over a leisurely lunch or enjoy tea, cake, and conversation with friends. Relax in the tranquillity of the walled herb garden or while the time away on the tea terrace. We serve freshly prepared hot or cold dishes and a selection of delicious homemade cakes Tuesday to Saturday, 10am to 4pm. Our menu changes seasonally, look out for our themed 'food in focus' items each month which celebrate the history of Barking and Dagenham through food. Valence House visitor centre is available to hire for events. We offer tailored packages to suit your needs and our team are on hand to help and advise you through the booking process, right up to your special day. Contact us for more information, to make a provisional booking or to check availability. We are more than happy to book viewings prior to your hire. We can also offer refreshments and catering for your event. Our booking form and commercial hire guide has information on available spaces, refreshments and what else we can offer you.